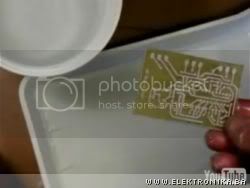 If you don't know how PCBs are made with a toner transfer method, you should check this video out. It is presented here because the process is described in detail, from thorough copper cleaning to etching in ferrum chloride and for the final step - instant tinning of PCB traces for oxidation protection. Forget about tinning with a soldering iron, this process is carried out very elegantly with a liquid tinning solution. In just a few seconds all PCB traces are protected from oxidation and eager to accept some solder.